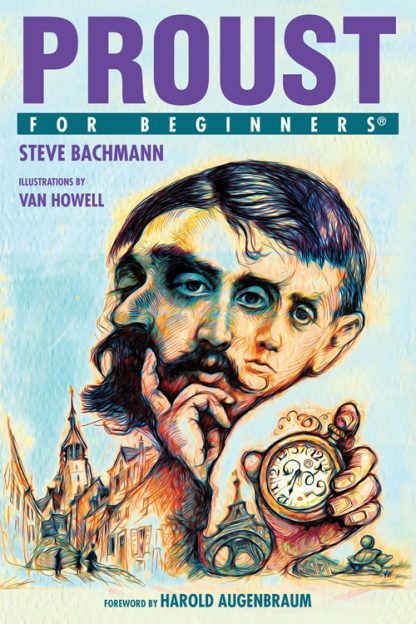 Proust For Beginners is a compelling biography of French novelist Marcel Proust and a vivid portrait of his times. It also serves as a concise guide and critical review of In Search of Lost Time (� la recherche du temps perdu, 7 volumes, 1913�1927), one of the most difficult�yet widely taught�works of French literature. With extensive passages from In Search of Lost Time and other essential works, Proust For Beginners highlights the defining themes and unique literary style of a modern master whom many have heard about but few fully fathom. It portrays Proust and the milieu in which he wrote in vivid detail, bringing to life the �Proustian moments� at the heart of his greatest work�and our own everyday experience. Proust�s masterpiece �begins in a series of rooms in which he unlocks themes, styles, references, and foreshadows,� writes Harold Augenbraum in the foreword. Proust For Beginners will provide the key. Steve Bachmann, AB (Harvard), MFA (UNO), JD (Harvard), now retired, worked for social change over the years as an attorney for many organizations including Project Vote, ACORN, Acorn Housing Corporation, Agape Broadcasting Foundation, and SEIU Health Care Illinois and Indiana. He is also co-founder of The New Orleans Art Review. Bachmann has written scores of law review articles and several books over the years, including Preach Liberty (Four Walls Eight Windows, 1990); Nonprofit Litigation (John Wiley and Sons, 1992); Lawyers, Law and Social Change (2001) published in conjunction with the ACORN Cultural Trust and Unlimited Publishing LLC. Van Howell is a political cartoonist, caricaturist, and book illustrator (Derrida For Beginners).